The orang utan is native in Sabah, Sarawak, and Kalimantan. 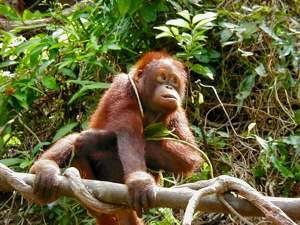 Various volunteer organisations have established orang utan rehabilitation centres in or near one of the Borneo jungle areas. Most rehabilitation centres have also set up visitor centres in order to support the up-keeping of, and education on the orang utan rehabilitation work. Tourists and visitors can visit these centres either as individuals or as part of a tour during their Borneo holidays. Many travel agencies in Sabah and Sarawak offer Orang Utan Centre tours every day. For individual visitors it is essential to only arrive at the feeding times, as otherwise there may not be access to the orang utans. The main orang utan rehabilitation centre in Sarawak is the Semenggok Orang Utan Rehabilitation Centre. Orang Utans are prepared for their release into the Borneo jungle. Visitors can see them at feeding time. Sabah has probably the most well-known orang utan rehabilitation centres. Orang Utans are prepared for their release into the Borneo jungle. Visitors can see them at feeding time. Kalimantan has several Orang Utan rehabilitation centres, mainly located in Central Kalimantan. Borneo has also other rehabilitation, and animal and nature conservation projects, often sponsored by international organisations.